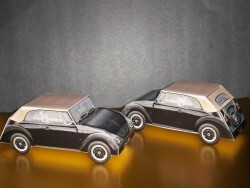 VW wedding favour boxes which are an exact replica of our vehicles Little Joe and Millie. 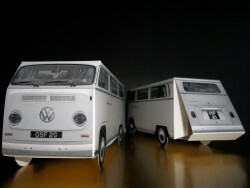 Now also available in White Split Screen and Bay Window versions. They will add something unique to your table decoration for your guests to keep. 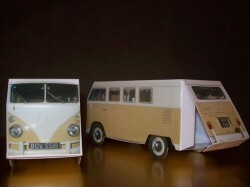 The favour boxes are die cut and printed on 300gsm glossy card. 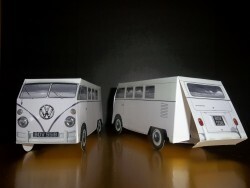 They are supplied flat packed for you to fold together easily yourself using the instructions provided, NO GLUE REQUIRED. All you have to do is decide what you want to put inside as a gift for your guests, although most will be fascinated by the box itself. Favour boxes are priced individually so you can order just exactly how many you need for your wedding party and can mix and match whichever type you want. 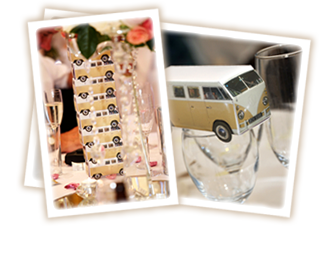 "We cannot thank Paul enough for everything he did for us on our wedding day on Saturday. Hiring this beautiful camper van was the first thing I booked when we decided to ..."
"Thank you Paul for making our day extra special. Absolutely loved the glasses and the champagne. Great team and lovely people. I will definitely recommend you to everyone..."